Our hunting season runs all year round, with certain species being more successful during certain times of the year, enquire with us directly for the best times of year to book. All huntable species are subject to availability and we reserve the right to remove one of the species on offer according to the sustainability of that animal at the time. 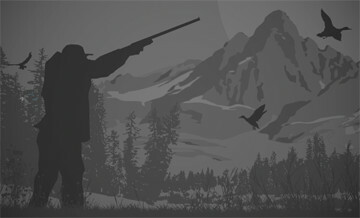 Clients will be designated a professional hunter for the duration of their stay. Most of our hunting is undertaken using the ‘spot and stalk, ‘stand’ and ‘still’ method. Our hunts are fair-chase and we pride ourselves in ethical and respectful hunting practices. Shots vary between 100-300 yards, we recommend you practice shooting from the long bipod shooting sticks as they are often used. We have traditionally been a rifle-hunting destination but in recent years, the bow-hunting trend has made its mark at us too. Success has been recorded with Impala, Bushbuck, Warthog and Bush Pig have also often featured in the bow hunters’ bags. Species are abundant so no traveling beyond the reserve is required to begin the hunt, enabling multiple attempts at these species with the bow during the entire safari. Various other species can provide hunters with surprise opportunities.